Author’s Note: This article was written a few days after 9/11/01. I re-post it here for your reflection on the seventeenth anniversary. Here we sit at another crossroads. Life offers so many opportunities for reflection. Where are we? What have we done? How is our way of life changed forever, for better or worse? What is the state of our nation? Are we a “kinder and gentler America” as Senior Bush once promised during his campaign for the presidency? Or are we set on a course towards oblivion? During the fall of the Roman Empire most people couldn’t imagine life being any different. Ask anyone who was there. Most people believed, I imagine, that the Roman Empire would continue forever. That it was too big, too large, too entrenched, too much the status quo for change to ever happen. Yes, they believed then as we believe now, that the American Empire will go on forever. Now that America is the world’s only superpower, we can arrogantly do whatever we want. We can invade Afghanistan. We can attack Iraq because we don’t like their leader. We can topple governments and establish dictatorships more akin to our way of thinking. We are America after all. America is good. America is God. America can do no wrong. So then why do so many people hate America around the world. Why is America seen as a threat? Why would anybody want to blow up the World Trade Center buildings and kills innocent civilians as an act of terror, an act of war? Have we stopped shopping long enough to really consider this question? Hmm. I don’t think we’ve learned the lessons from 9/11. And until the American people learn the lesson, the teacher is going to continue to pursue terrorist attacks against America at home and abroad. And all our efforts towards establishing “homeland security” will be ineffective and absurd. The only ones more secure are the terrorists themselves, secure in knowing that if the conditions around the world and in many poor countries don’t change, that if American foreign policies don’t change, that if the rich continue to plunder the poor, that more terrorist attacks will be justified, in fact necessary to tame the beast. But American’s will have to stop shopping and watching television long enough to reflect upon these conditions, to inform and educate themselves about global issues and concerns. And if we fail to do so, our way of life is destroyed. Our so-called democracy has failed and tyranny and absolute dictatorship will replace it. 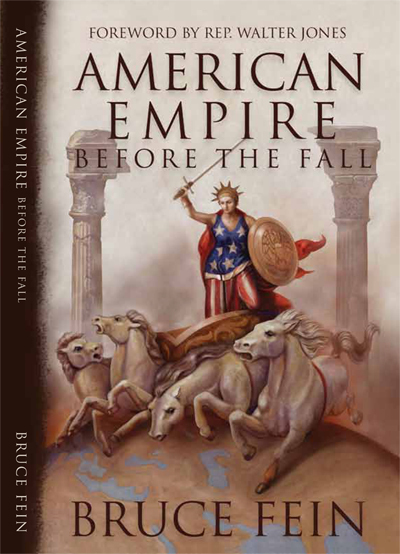 Furthermore the American Empire will fall just like the Roman Empire did. Bush fiddled while America and the World Trade Center towers burned. We have a lot to learn. What does 9/11 mean to you and what have you learned? What I’ve learned since 9/11 is that the USA Patriot Act has amended fundamental law unconstitutionally to provide additional powers to the goverment, to the Executive Branch, the FBI and the Attorney General’s office in the Department of Justice, and especially to the banker’s. This is a banker’s bill to protect the Federal Reserve Banking cartel and punish those who might compete with them, foreign or domestic. This bill was passed by the U.S. Congress without reading it after 9/11. It was prepared for the U.S. Congress by the attorneys for Morgan-Chase, the largest bank in America. All of these actions are unconstitutional as they contradict our unalienable rights as a sovereign people. So you have to ask yourself under this law, are there any possible situations where you might be considered a terrorist by your own government? So who and where are the real terrorists? I think you know by now. Government has closed once-public immigration hearings, has secretly detained hundreds of people without charges and has encouraged bureaucrats to resist public records requests. Government may prosecute librarians or keepers of any other records if they tell anyone that the government subpoenaed information effects without probable cause to assist terror investigation. Government may monitor federal prison jailhouse conversations between attorneys and clients, and deny lawyers to Americans accused of crimes. Government may search and seize Americans’ papers and effects without probable cause to assist terror investigation. Government may jail Americans indefinitely without a trial. Americans may be jailed without being charged or being able to confront witnesses against them related to a terror investigation. Intelligent news for the rest of us. Author’s Note: This article was written three years after 9/11/01. It’s re-posted for your reflection on this 13th anniversary of an event that changed America forever. In the hours and days following the tragic event of 9/11, I experienced a strange and wakeful honesty in the American people. As if a spell cast by dark forces had been broken, I witnessed honest emotions and tears huddled around television sets, on the streets, in the bars, offices, synagogues and churches, even in the confused looks of the newscasters reporting the news who had no clue what was happening. For the first-time, nobody was cuing them in their earpieces, spinning the news and telling them what to say. They had to improvise. These hours and days following the collapse of the World Trade Center, the plane crash in Pennsylvania and the Pentagon, was a time of breakdown and breakthrough. Not since the assassination of John F. Kennedy, Robert Kennedy, Martin Luther King and John Lennon, had I experienced such a tragic yet spiritual and emotional awakening in America. These are the times that try mens souls. What do you remember feeling that day? When did the grief really hit you in the heart? When did the shockwave’s of disbelief rock your world? 9/11 changed everybody and everything forever in America and the world. Whether it changed for the better or worse depends on what you are willing to look at and question. So what happened in your world beyond 9/11? What are you going to do about it? How are you going to change your life in the future for the better? How are we going to change our strategy for ending “terror?” What can you and I do to prevent such an atrocity from ever happening again? How can we win this “war on terror” and ever achieve true security? What are you willing to do to create “another world order” where another 9/11 is unthinkable anywhere in the world, not just in America? What are you willing to admit about America’s responsibility, we the people’s responsibility for creating conditions in the world over the last five decades that have left millions of people in enough despair and hopelessness to hate us? Why haven’t we listened? Why haven’t we cared enough? Why haven’t we done enough to respect those who think and believe differently than we do? What really happened that day? Who is really responsible for engineering that event? Did the 9/11 Commission get to the bottom of it and tell the whole truth and nothing but the truth to the American people? Was Bin Laden really the culprit or was he just the fall guy like Oswald or another CIA asset? So on this anniversary of 9/11, what have you learned? I learned to stay more awake to what’s really important in my life. My priorities shifted. I learned to be more watchful of what’s being said in the media, listening carefully to the lies between the lines. I am more willing to stand in disbelief than to rush into a false belief or conclusion. I’m not as willing to believe without questioning authority and the status quo. According to a Zogby International poll released last month, almost 50% of New Yorkers believe the government knew 9/11 was going to happen and did nothing to stop it. History teaches that 9/11 could very well have been planned by a cast of characters much larger and closer to home than we’re being told or have been willing to believe. Remember the Reichstag? Hitler planned it to discredit his opponents and seize power. He accomplished his goal by a secret act of terror against his own people. Is it possible something similar happened with 9/11? Are you more willing to question external authority and doubt the veracity of our leaders? Are you more willing to trust your own internal authority? Are you more willing to become a leader in your own life and in the lives of those around you? Are you more willing to find out the truth for yourself and use your own mind to discern truth from lies? Have we as a people, as a nation awoken more to the truth since 9/11, or returned to sleepwalking through our existence? Are we just too busy surviving, too tired, too lazy and too scared to live in the truth? Have we returned to the business of struggling to survive, just paying the bills, drugging ourselves with anti-depressants while entertaining ourselves and struggling to succeed in a no-win, dead-endgame? Or are we beginning to question external authority and the mainstream media story? Are we the people going to wake up for good or fall hopelessly back asleep? You decide. Are we the people still true believers in the mainstream media story spun hours and days after the tragic event of 9/11? Or are we willing to discover the truth for ourselves, at least doubt enough to question? Bin Laden as the perpetrator of 9/11 was spun out long before there was any evidence. In my mind, 9/11 was written like a movie script, not a real world event. There are too many unanswered questions and missing pieces to be a sound explanation. What are they hiding and where is Bin Laden? Why are we not getting the whole truth and nothing but? Are we the people tired of being lied to, tired of being cheated and robbed of the truth in broad daylight? Are we ready to step into our own power and face the uncomfortable truth? There are huge and credible doubts being illuminated from many competent and credible sources? There are mountains of evidence that not only have the American people and the world been lied to by the mainstream media and our leaders, but high-level officials in several governments were complicit if not altogether in on the planning and implementation of 9/11. During our darkest and most dangerous hour, agencies and individuals with the power and capacity to defend America acted incompetently. Instead of defending the country as they are obliged to do, the FBI, CIA, Pentagon, security at the airports and strategic air defenses all failed to prevent the attacks. That became clear after the 9/11 Commission reports. They could have shot those planes out of the air before they hit the buildings. They didn’t. Why not? Who was in charge? Who gave the order to disengage the strategic air defenses (AWAC) violating long-time standard procedures? Only two people in the world have that power: President George W. Bush Jr. and the NATO commander-in-chief. America was attacked on September 11th, 2001, but so was the world. Yes. America was attacked on her own soil, but by whom and for what purpose? Who benefited? Who profited? Who is paying the price? You and I are losing our freedoms, losing our liberty in the name of a perpetual “war on terror,” losing our country and our way of life. This loss is as much a result of the attack on America as our reactive and immature response. Since the war in Afghanistan and the war in Iraq America and the world is no safer, but less secure since 9/11. The Department of Homeland Security promotes “terror” at home and abroad. “Terror” is now institutionalized. “Terror” is now part of the American dreamscape. America has changed forever, and at this juncture America has changed for the worst not the better. It’s not Bin Laden and Al Queda causing economic instabilities at home, although he’s a great scapegoat. Our economic decline is directly a result of failed leadership, shortsightedness, greed and complicity as a people permitting the loss of liberty to fight this no-win “war on terrorism.” America is finally paying a price for our sins. America is now a dying nation, just a memory of a once free country of free people, rapidly becoming another third world country economically. Who looks each other in the eyes on the streets and extends a warm welcome anymore? Who do you trust? Why are we projecting so much fear and suspicion upon each other? America is a nation no more. America is acting like a global tyrant and bully in the eyes of most of the civilized world. America is looking and feeling more like fascist Germany or communist Russia these days, not the America I love. Flying into New York City after the Republican National Convention last month, I witnessed a city and a government under siege, under military occupation with troops and helicopters, police and barriers everywhere. How long can the U.S. Government hide behind their prison walls and keep the truth from us? We the People as a nation are dying. Liberty and justice for all is dying. Are you going to help America be reborn as a free country or let it die in your arms? You decide what you are going to do about it. Do you accept in your mind without question, without concern, these profound changes in America, our republican form of government and the limited power delegated to our leaders? Have you changed your mind to accommodate the perpetual “war on terrorism,” or is it still just a bad dream? Will you stand up for the nation America could be again? Do you accept airport security systems as a necessary sacrifice in the “war on terror”? Or do you avoid airport security systems by refusing to fly commercially? Security Authority haven’t to my knowledge caught a single terrorist at any airport, yet millions of us must suffer delays, interrogation, blacklisting and invasive searches on a daily basis just in case one is found. This is not a security system. This is an insult, an indoctrination system for the American people. Get used to the police state. Today, it’s more security at the airports. Tomorrow, it’s the military policing your hometown or in New York City or Washington D.C.. The day after 9/11, I knew in my gut that America had changed forever. I knew it then and see it now. If I could push a magic button and whisk America back to September 10th, 2001, I would push that button now. But I cannot. I don’t have that power. Pandora will never go back into the box. Sooner or later, we the people must step beyond denial and look squarely into the eyes of our future, for better or worse depends completely on you and I.
Here’s a simple theory about 9/11. 9/11 was an inside job planned by high-level officials in several governments (e.g., United States, United Kingdom and Israel). 9/11 was a covert operation planned by several intelligence communities (e.g., CIA, British intelligence, Mossad, Pakistani intelligence) on behalf of these governments and other powers in collaboration with Bin Laden and Saudi Arabia. 9/11 was another stepping stone for establishing world government and destroying national sovereignty. The purpose for 9/11 was to change America’s democratic form of government into a fascist form of government by emergency decree of the President and by reorganizing the federal government’s police powers in a Department of Homeland Security. The purpose for 9/11 was to perpetuate a “war on terror,” justify America’s empire-building around the world in 162 countries where America has a military or police presence to secure future oil and continuous profits from war. 9/11 was a coup d’etat of the American political system which succeeded royally in duping the public to accept a change in government. 9/11 ushered “neo-conservatism” and the Israeli lobby for American military superiority in the Middle East into power. Look at America today. Compare America with 2001 before 9/11. America’s not the same country. The whole world has changed. Did you know the term “homeland security” was extracted directly from Adolf Hitler’s “Mein Kampf.” The global elite bent on imposing world government for their benefit alone are not only laughing at America, they are killing our sons and daughters on the battlefield of war while we the people stand by watching television and reading the same old manufactured news in the papers. Read the writing on the wall? You don’t need a crystal ball to see where America is going? Do you still believe it was Bin Laden who orchestrated 9/11, acting alone or in consort with Al Queda? Do you still believe Saddam Hussein had anything to do with 9/11? Are you not aware both Bin Laden and Saddam Hussein were put into power, provided guns, weapons and trained by the CIA? Do you still believe Al Queda, created by the CIA while Bin Laden was under their employ, exists independent of our own intelligence community? Factions within the U.S. Government created a new enemy for the global elite in Al Queda so America could fight the perpetual war for profit and change our form of government more to their liking. All our expensive and futile efforts at fighting this elusive “war on terror,” post 9/11, have done nothing to stop “terrorism” or catch and prosecute a single “terrorist” responsible for the attacks. If anything, our efforts have poured gasoline on the fire and created more terrorists. If anything, our efforts have stimulated and institutionalized the perpetual continuation of the problem of “terrorism,” not its resolve. We’re chasing ghosts of America’s past interventions and acts of terror against 162 countries since 1801. We’re chasing boogie men. We’re attacking innocent nations instead of the perpetrators and pointing angry fingers at any Arab-looking person we can blame. How do you blame 2.5 billion people for such a crime? Because the global power structure and the global elite considers the “war on terror” a solution, a means to maintain absolute control on the world as they’ve engineered it. The “war on terror” is the means for keeping power by perpetuating any highly profitable war and making the people pay for it with blood and taxes. It’s a no-win scenario, but the chosen strategy of the hour. There must be a better way to attain world peace. With few exceptions, our present leaders will not change it. They have a vested self-interest to maintain the status quo at all costs, even a “fascist” status quo leading us down the road to global communism and a total police state. The change in policy and tactics must come from people with a vision outside the government, from leaders independent of the political process with the capacity for communications, diplomacy and statesmanship. The agenda is to implement massive change of our political and economic landscape. It must come from you and I. There must be a massive revolution of consciousness, sovereign-minded and compassionate people willing to step into uncomfortable situations and take leadership where the banks, the government, the politicians, the courts and corporations have failed. The“war on terror” will not end without addressing the roots of war: poverty, injustice, ideological differences, religious intolerance and tyranny. This war will not end by imposing the idea of “democracy” at any nation, Arab or otherwise, then proceeding to rule them by dictatorship as we’re doing in Iraq. Such hypocrisy only inflames their hatred towards America. This war will not end without intelligent conflict resolution and diplomatic skills wielded by statesmen and stateswomen detached from political or personal gain. America is blundering through the world like a bull in a china shop. America has become a threat to freedom and democracy everywhere. As the world’s only superpower on behalf of global corporate interests, America has become a bully pursuing self-interest and exploiting anywhere we please. America is the new bully on the block. America has lost its vision, its moorings, the foundation of liberty and justice for all. Mostly, America has lost its sense of leadership and respect in the world. America lashed out at Afghanistan and the Taliban in a rageful fit, yet none of the purported terrorists were from Afghanistan. Most were identified as Saudi Arabians, yet we did not attack Saudi Arabia. If Bin Laden was in Afghanistan, he was well-hidden in some cave, or sequestered in a luxury hotel somewhere unbeknownst to American, British and Israeli intelligence? Or has Bin Laden been dead for years and the CIA has been doctoring up some old videos to make us think he’s still alive and masterminding his next attack on America? You can’t believe everything you watch on television or read in the newspapers. America lashed out at the people of Iraq and Saddam Hussein looking for weapons of mass destruction that were not there. Or was the war really about confiscating the oil for American and British companies? America struggles to occupy an Islamic country that has no interest in foreign rule, especially from “infidels.” America is isolated and alone in the global community, with few allies in this effort. What happened to the justifiable outrage after the attack on America? Has it turned upon America and the world in a strange, twisted and self-destructive way? Have we poisoned the soul of a nation and turned into our own worst enemy perceived as a threat even by our friends in the global community? Are we just another example of an another empire destined to collapse, not from foreign invaders, but from a collapse of integrity within? Our daily lives in America and in the world have changed forever. Elected representatives, political opportunists and judicial activists at home have taken advantage of our character weakness, our fear and confusion to foist a new way of life upon America inconsistent with long-held principles inherent in the founding of this country. Instead of grieving with us on this day, the opportunist at home serves their greedy self-interest and bolsters an un-American agenda. Anyone of sane mind, might dare call it treason. We now live in a police state, a virtual dictatorship by the President resulting in less freedom, less liberty, more incursions into our daily lives, spying by the FBI into our private lives, attacks upon our liberties by the Department of Justice, all using the same lame excuse of fighting a “war on terror,” a war that cannot be won. The Department of Justice acquired sweeping new powers under the “USA Patriot Act.” The President can list anyone as an “enemy combatant,” strip them of the writ of habeas corpus, due process and a trial, even representation by an attorney to defend themselves. This is a dangerous precedent and has no place in a free country, a republic of, by and for the people. Although, this power has been somewhat restricted by the U.S. Supreme Court, it’s still a dangerous power and precedent. I repeat, the “war on terror” cannot be won anymore than the “war on drugs,” the “war on poverty” or any of the other so-called wars declared by the U.S. Government. These wars are marketing concepts created by government public relations departments, not solutions to pressing problems and global issues. Problems are not solved by declaring war or creating a new government bureaucracy. Problems are solved by thoughtful examination of all the factors involved and implementing a careful conflict resolution process addressing the underlying roots and causes. It takes a great mind and deep heart to take opposing ideas and resolve conflict, not a bully. Empowerment and change. So what can we do about it? As Gandhi once said, “It may seem very insignificant what you do, but it is very important you do it.” Large or small actions, each one of us can make a difference in America and the world. Together we can shift the tide towards liberty and justice for all, limited government and the rule of law and compassion. We can wake up, get educated, become prosperous and share wealth with others. We can implement a bigger idea of “sovereignty” in our lives, take responsibility and reclaim title to self and property. We can work on the environment, raise a child, create new businesses to solve problems and provide services to those in need. We can identity the causes, problems and conditions underlying terrorism and create new results and solutions. It takes resolve. It takes willpower, competence, intelligence and leadership. Are you willing to step into leadership now? It’s not the few truly evil people in the world that concerns me most. It’s the good people, good men and women who stand by and do nothing when evil does its dance. Do something, anything to make a difference. You can. Artwork: Norman Rockwell’s Famous Four Freedoms: Fear, Religion, Speech and Want. The senior counsel to the 9/11 Commission – John Farmer – says that the government agreed not to tell the truth about 9/11, echoing the assertions of fellow 9/11 Commission members who concluded that the Pentagon were engaged in deliberate deception about their response to the attack. Farmer served as Senior Counsel to the 9/11 Commission (officially known as the National Commission on Terrorist Attacks Upon the United States), and is also a former New Jersey Attorney General. Farmer’s book about his experiences working for the Commission is entitled The Ground Truth: The Story Behind America’s Defense on 9/11, and is set to be released tomorrow. Only the very naive would dispute that an agreement not to tell the truth is an agreement to lie. Farmer’s contention is that the government agreed to create a phony official version of events to cover-up the real story behind 9/11. The report revealed how the 10-member commission deeply suspected deception to the point where they considered referring the matter to the Justice Department for criminal investigation. As we also reported in August 2006, released portions of NORAD tapes from 9/11, which were featured in a Vanity Fair article, do little to answer skeptic’s questions about the impotence of U.S. air defenses on 9/11 and if anything only increase focus on the incompatibility of the official version of events with what is actually known to have taken place on that day. Make no mistake, Farmer is not saying that 9/11 was an inside job, however, Farmer’s testimony, along with that of his fellow 9/11 Commission members, conclusively demonstrates that, whatever really happened on 9/11, the official story as told to the public on the day and that which remains the authorities’ version of events today, is a lie – according to the very people who were tasked by the government to investigate it. This is a fact that no debunker or government apologist can ever legitimately deny. What Do NORAD’s 9/11 Computer Chat Logs Reveal? After twenty years as an author and educator in the sovereignty and freedom movement worldwide we’ve learned what we can and cannot do in these times to restore the true vision of America given the political, economic and legal climate of the US today. This historic talk on “Independence Day” weekend will inspire and rock the very foundations of your preconceptions about America and the world. 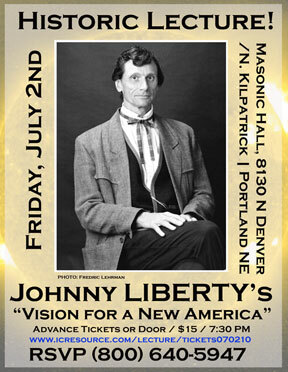 John David Van Hove (aka Johnny Light/Liberty/Love) is an author, educator, researcher, business developer and public speaker extraordinaire in many topic areas including sovereignty, freedom, liberty, history, law, economics, money, leadership and the true nature of power. Indigenous peoples were the earliest known settlers of this diverse and bountiful land – and others followed. One individual, Gilbert Gable from Port Orford and others, including, members of the 20-30 club in Yreka, the Yreka Chamber of Commerce, the Siskiyou County Board of Supervisors, State Senator Randolph Collier and Judge John L. Childs of Crescent City made the most successful and most publicized attempt at creating a new state from the bottom portion of Oregon and the top portion of California. There have been many attempts at forming a new state comprised of northern California and southern Oregon, but none has gained so much attention and retained it as the secession movement of 1941. The abundant supply of minerals and timber in this region was largely inaccessible due to the lack of sufficient roads and bridges into the rugged mountain border country. The local pioneering people grew weary of unfulfilled promises from Salem and Sacramento to help fund sufficient highway projects in the region while building campgrounds in the cities where there were more votes. Representatives from the mountain border counties involved met in Yreka, CA on November 17, 1941 to form an alliance to obtain federal aid for the construction and repair of bridges and roads. The Siskiyou County Board of Supervisors voted to allocate $100 to research the possibility of seceding from the state of California and joining the other counties to form a new 49th state. The Yreka Chamber of Commerce was very instrumental in persuading the Board. The local newspaper ran a contest to name the new state and the winning entry was Jefferson. The winner of the contest pocketed $2 for his efforts. Yreka was designated the temporary state capital where the ‘State of Jefferson Citizen’s Committee’ was formed. They proceeded to stop traffic on Highway 99 outside of town and handed their ‘Proclamation of Independence’ out to travelers. Jefferson made the papers nearly every day, competing with headlines of Germany’s ravaging of Europe. The San Francisco Chronicle sent a young reporter, Stanton Delaplane, to cover the events. He traveled the rain-soaked roads to speak with locals to get a feel for the secession movement from their point of view. He got stuck in the mud down the Klamath River but that did not stop him from writing a series of colorful articles on the rebellion which earned him the coveted Pulitzer Prize. On December 4, Judge John L. Childs of Crescent City in Del Norte County was elected governor. A torchlight parade complete with horses, marching bands and sign-carrying young people riding in trucks was held in Yreka followed by a ceremonious inauguration held on the courthouse lawn. Hollywood newsreel companies were present to record the events, including the highway barricades. The State of Jefferson was off to a banner start. The newsreels were to air nationally the week of December 8, but tragically on December 7th Pearl Harbor was bombed and the State of Jefferson rebellion of 1941 came to an end. The people of the region went to work for the war effort and good roads were eventually built into the backcountry to access strategic minerals and timber. These same roads have helped countless numbers of rural families make a living from the land that continues to produce abundant, quality natural resources. The State of Jefferson ‘state of mind’ remains in the hearts and minds of people everywhere. America has had a non-violent revolution. As long as there are historians writing about the United States, this moment of fundamental re-alignment of our national purpose will be remembered, pored over and analyzed. It will be seen as one of the shining points along the evolutionary arc of the American story. Yet it will never submit itself to being summed up in a nice little package that reason alone can understand. We were certainly excited in the l960’s. And this is 2008; exactly forty years since the most dramatic and violent year of the Sixties decade: the year when both Bobby Kennedy and Martin Luther King Jr. were literally killed before our eyes. At that point, a generation of young people — looking much like the youthful army so out in full force today, only grungier — marched in the streets to repudiate an oppressive system and to try to stop an unjust war. the public sector to whomever wanted it so much that they were willing to kill for it. And for all intents and purposes, we did as we were told. According to ancient Asian philosophers, history moves not in a circle but in a spiral. Whether as an individual or as a nation, whatever lessons we were presented once and failed to learn will come back again but in a different form. For the generation of the Sixties and for our children, the lessons of that time — as well as its hopes and dreams and idealism — came back in 2008. During our forty years in the desert, we learned many things. Then, we marched in the streets; this time, we marched to the polls. Then, we shouted, Hell no, we won’t go! This time, we shouted, Yes, we can. Then, we were so angry that our anger consumed us. This time, we made a more compassionate humanity the means by which we sought our goal as well as the goal itself. In the words of Gloria Steinem, I feel like our future has come back. And indeed it has. For in the words of Martin Luther King, Jr., No lie can last forever. What Bobby Kennedy tried to do, and was killed for trying; what Martin Luther King tried to do, and was killed for trying; what the students at Kent state were trying to protest, and were killed for daring to; Barack Obama and his army of millions of idealists with the audacity to hope have now succeeded at doing. posted, in their own way, angels to Obama’s left and angels to his right, angels in front of him and angels behind him, angels above him and angels below him. I know I have, and so has everyone I know. Hopefully we will continue to do so. collective redemption as from his determination to achieve an individual accomplishment. And those who fail to recognize the invisible powers at work here — who see the external drama of a political win yet fail to discern the profound forces that moved mountains by moving the American heart — well, they’re just like Bob Dylan’s Thin Man to whom he sang, You don’t know what’s going on here, do you, Mr. Jones? and as a culture, to pull it off. non-violent revolution that did not quite fail, yet also did not quite succeed in the l960’s — has entailed separating from who we used to be. cannot and we must not fail to do everything humanly and spiritually possible to support him. For his sake.. and for ours. Having gone to a higher place within ourselves, a higher level of leadership began to emerge among us. A higher level of leader now having emerged among us, he calls us to an even higher place within ourselves. These two forces together can and will, as Obama has said, truly change the world. Having moved one mountain, we’ll now remove the ones that remain. With God’s help, yes we can. Yes we did. And yes we will.